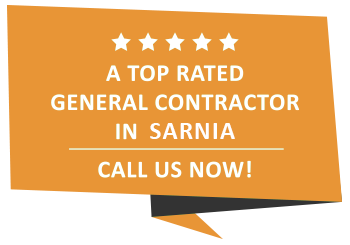 General Contractor | Sarnia | Carosyl Home Additions Inc. They say that the kitchen is the heart of the home, it therefore makes sense that it should be taken care of it properly so as to ensure that it can channel all the positivity into the other arteries of your house. The kitchen is the heart of the home. This may sound like a cliché, but it's true. It is so much more than a place to cook and prepare food - it's a place to gather with friends and family. Your kitchen wears many hats, but it may not be living up to its full potential if it has never been renovated. A kitchen renovation can open up your kitchen, giving you that extra space you need. From small changes like new countertops, to large scale modifications like the installation of a kitchen island, Carosyl Home Additions Inc.'s skilled contractors have the experience and passion to help realize your renovation dreams. While it may be one of the smallest rooms in your home, your bathroom is definitely a room where guests will venture. Upgrading features in your bathroom will allow for a luxurious experience. Many people tend to think of their bathroom as something that solely needs to be functional - if it's doing its job, then it's good enough. When you think about how much time is spent in that small room however, it becomes worthwhile to make some changes. Not only will renovations boost your bathroom's appeal to guests, it will make the time you spend there more enjoyable as well. Let’s be honest about it, a dining room isn’t just for dining. It is also the place where you will entertain guests, the room where you will spend Christmas dinner with your family and loved ones and it is, most likely, also the spot where you will celebrate the most important birthdays and anniversaries. Your dining room should be the room in your house that you are most proud of, if it’s not then something is wrong. So, if you feel that your Sarnia dining room could do with a floor renovation or if you simply feel that your overly used cabinet has seen better days then don’t hesitate to contact us. We offer free dining room appraisals to all new customers and are here to help you make the best decisions. The dining room is the jewel in your home, our job is to make it sparkle again. Basements are often where all of our unwanted possessions are relegated - those skis you use a handful of times a year, those old boxes of clothes, too often basements become nothing more than a dumping ground for stuff, but it doesn't have to be that way! Renovations are particularly beneficial for homeowners with a growing family. That extra space has the potential to be an awesome escape - a home theatre, game room, a bar, and much, much more! Get in touch with Carosyl Home Additions Inc. to find out how your basement can be transformed from just another room to something truly wonderful. For most Sarnia homeowners that attic is the so-called poor cousin of the basement. Yes, it is a place where you can store old Christmas lights and even older boxes of clothes than the ones stored in your basement but in general it is a room that most homeowners don’t pay very much attention to. However, failing to do so is a big mistake as most attics in a house have vast amounts of untapped potential that if utilized correctly could revolutionize the upper most floor in your home. At Carosyl Home Additions Inc., we take great pride in the fact that our skilled team of attic specialists has converted hundreds of attics in Sarnia. As such, they have the skill and knowhow to turn this dark and dreary room into something completely different. The options at your disposal with the creation of a trap door and a little creativity are endless. Our attic specialists could transform this unused room into a guest bedroom, a gaming den or an additional cozy office space. The natural light on display from such an elevated point in your home also makes this room a great fit for a sky light, meaning that it will make the room feel much bigger than it actually is. Similarly, an attic could make a very interesting upstairs lounge space fitted with long couches to maximize the often narrow dimensions in these rooms. Nothing improves curb appeal quite like siding. Additionally, new siding can reduce your utility bills by improving the energy-efficiency of your home. At Carosyl Home Additions Inc., we have many siding options to choose from, so whether your motivation is practicality or aesthetics, we have you covered. Wave those costly utility bills goodbye with new siding! Before you consider packing up your bags and leaving the neighborhood you love, you should consider a room addition. Adding an extra room or two to a home is a great solution for those looking to expand their families, or simply add a bit of extra space to the house. Carosyl Home Additions Inc.'s team will work closely with you to make sure that the new rooms fit seamlessly in with the rest of your home. What is Your Background? While it is true that everyone has to get their start somewhere, the fact of the matter is that you don’t want your home to be a learning ground for fresh and inexperienced contractors who don’t know what they’re doing. To counteract this problem, we at Carosyl Home Additions Inc. make sure that every job we work on has a healthy mix of experience and youth. But we will never begin a job without making sure that an inexperience and certified team of contractors are in place to lead the project. Are You Licensed and Insured for the Job? Truth be told, this might be the most important question you ask your general contractor. To put it simply, if you are dealing with a general contractor that isn’t insured or fully certified, then they shouldn’t be anywhere near your home—it really is as simple as that! At Carosyl Home Additions Inc., we are fully insured and can provide you with protection in the unlikely event that any accidents or mishaps occur while the work is in progress. The general liability insurance that we have in place protects your family home for any unintended issues that may occur during building. What’s more, it also covers in case of any freak accidents including storms. We always make it a priority of ours to ensure that we provide all our residential clients with a copy of our insurance form. Will Sub-Contractors Be Hired on This Job? The answer to this question is very important and something that you need to consider very closely when you are making a final decision on which general contractor to choose for your work. The simple fact of the matter is that nine times out of ten, contractors may need to employ the services of a sub-contracted plumber, electrician or carpenter to complete a job on time and under budget. Understandably, this can send alarm bells ringing in the heads of homeowners who are uncertain what standard of skilled professional they are going to get. However, with us, you can be guaranteed that your home will receive a high-quality sub-contractor that we know and trust. All the skilled tradespeople we work with have a wealth of experience and their expertise is what attracted us to them in the first place. They share our commitment to general contracting excellence and will never settle for anything less than perfection. With more than 30 years of doing business under our belts, you can count on us to get the job done right. We will be by your side to offer advice on layout plans as well as materials for countertops, siding, flooring, and finishes. Whether you have a clear idea of what you're looking for, or you're starting from scratch and need help getting things all planned out, we would be happy to help. We pride ourselves in providing Sarnia with work of an incredibly high calibre. In fact, many of our customers seek our services for subsequent projects after being so impressed by the work we initially performed for them. Contact Carosyl Home Additions Inc. today! If you are in Sarnia and interested in learning more about our general contracting services, we invite you to give us a call. We look forward to making your renovation dreams come true!